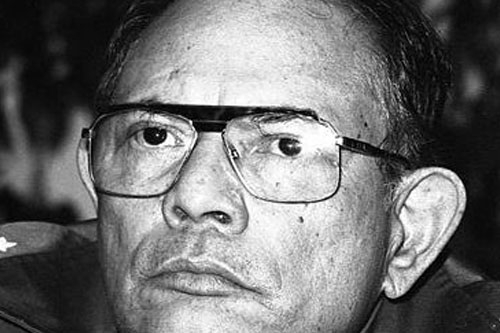 Tomás Borge Martínez, the historic Nicaraguan revolutionary leader, died on 30 April aged 81. Borge had been a consistent and leading fighter at the centre of Nicaraguans’ struggles against dictatorship and imperialism for decades. He was an intellectual driving force of the revolutionary socialist movement and was revered by the left in Nicaragua. Born in 1930, he left university before graduating in order to dedicate his life to progressive and socialist politics. The Somoza family’s rule of Nicaragua was strongly supported by the United States government. Imprisoned in 1956 for opposing the dictatorship, he managed to escape in 1959 and fled to Cuba where he sought support from the new government led by Fidel Castro. In 1961, Borge was one of three founders of the Frente Sandinista de Liberacion Nacional (Sandinista National Liberation Front – FSLN). The movement was named after August Sandino, who had fought against US military intervention in Nicaragua in the 1930s. Borge trained FSLN recruits for the guerrilla struggle that was waged across rural and urban areas. The movement built up mass support amongst the population. Borge was captured in the capital Managua in 1976 and severely tortured before the FSLN seized the National Palace in 1978 and won his release. His first wife, Yelba Mayorga, was tortured and killed by the National Guard in 1979. Somoza was toppled in 1979 by the Sandinista uprising and the new FSLN government set about introducing health care and education for the masses. The United States, under President Reagan, launched a counter-revolutionary war. For a decade it spent hundreds millions of dollars building, arming and directing a Contra rebel force to oust the Sandinistas which, in true US ‘progressive’ fashion particularly concentrated on killing teachers and doctors helping the population. Borge was effectively the Nicaraguan commander during that war and he also created the neighbourhood Sandinista councils that organised defence of the revolution. The 11 year long Contra war of terrorist attacks killed 30,000 people and ground down the population’s determination to resist the military offensive. Effectively the US offered the population an end to the violence if the FSLN was replaced with a US client regime. In 1990 a war weary population voted the Sandinistas out of office. Daniel Ortega and the Sandinistas were elected back to government in 2006 and in 2007 Borge was appointed Nicaraguan Ambassador to Peru. In 2011 when the Sandinistas were again re-elected Borge was also elected to the legislature. Not only Nicaragua but the world has lost an outstanding and inspiring leader. Remember the Nakba – End Israel’s ethnic cleansing now!